Respond to the health conscious market with a variety of milk products that can be placed in the AMS MILK VENDING MACHINE. This machine comes in 2 sizes 35″ & 39″ widths. Medium to Large locations. AMS Milk vending machine is a healthy & wise answer to the scorching sun. From cartons to bottles without spacers or shims, the AMS Milk Vending Machine can easily vend various different sizes of milk containers. Coming with a capacity of AMS 35″ – 240 units, AMS 39″- 288 units, AMS Milk vending machine can hold an eclectic variety of milk products. AMS Milk vending machine comes with 5/8 HP refrigeration unit with heated triple-pane glass, which makes this milk vending machine more powerful and stable than any other milk vending machine in the market. 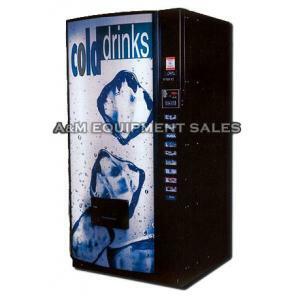 AMS Milk vending machine is a must buy for people who supply milk or milk based products in large quantities. Not only does the AMS Milk vending machine has the capacity of holding 240 units, the temperature maintained inside it also makes sure that the quality and taste of milk products remain intact. Best suited for medium to large locations! The AMS Milk Vending Machine can vend many different sizes of milk from cartons to bottles with no spacers or shims. First in first out delivery for product rotation. Guaranteed delivery of your product or your money back! Credit card capable: Optional card reader can be installed $299.00. This machine comes with 5/8 HP refrigeration unit with heated triple-pane glass. 9 month school financing available. SUDIA rebates available for schools. NAMA and ETL certified and made in the USA. 3 year parts warranty excluding fluorescent bulbs, glass, and paint finish. Shipping not included. We are an authorized factory distributor for this machine. Telephone technical telephone support available Monday – Friday 8:00am – 5:00pm EST for as long as you own the machine.